You’ve heard about it all of it, but a parade of finished and gifted knits is excellent closure. Plus, I didn’t really publish any proper shots of the finished pieces in case there were spies, so now you can see everything in its glory. First up, the Daphne socks (a Cookie A. pattern) I knit for Jenny using Indigodragonfly Merino Silk 4-ply sock in Don’t You Have an Elsewhere to Be?. They were the first gift I finished and, weirdly, the first to be opened. They fit her very well and she says she can’t wait to go to a party where she can show them off. I am going to have to knit myself a pair of these very soon I think. My dad’s hat was something I half-planned for a while and then executed at the last minute. Initially, my plan was to design a fair isle hat in subtle greys, but I didn’t do it and then ran out of time, so things changed. I picked up some SweetGeorgia Superwash Worsted in Slate from the shop and, after a quick browse on Ravelry, settled on the Men’s Mock Aran Men’s Hat by Heather Tucker. It was basic enough to be an everyday hat for my dad, but interesting enough that I didn’t resent it during the knitting. Next time I knit this, I’m charting it. After starting a pair of mittens for Connie and then deciding that both pattern and yarn were wrong, I switched to these Lily Mittens by Annemor Sundbo. I ended up using some Louet Gems from my stash (in Willow and Navy) and, honestly, I couldn’t be happier. The Louet was really nice to work with and the finished mittens fit perfectly. Finally, the tea cozy. What a friggin’ saga. I finished it in good time and then sewed in all the ends and then went to the workroom and sewed a lining before I left. I did think it looked a little big, but my mum’s tea pot is enormous, so I didn’t think much of it. I tried it on the tea pot when I got to my parents’ and wouldn’t you know, it was enormous. Luckily, I had not yet sewn in the lining, so I threw the tea cozy in the washing machine for a little felting action and, when it got about as small as I could make it without risking over-felting, I cut and re-sewed the lining and then sewed it in. Phew. It’s still a little big, but my mum is thrilled anyway because it’s the first tea cozy that’s ever actually covered the entire tea pot. I don’t know why the colours came out like this in the photo. They’re much more accurate here. I don’t really have pictures of the mittens I gave my grandmother (besides those you’ve already seen) or the foot tubes, because I didn’t have my camera on me when they opened them. The mittens were a perfect fit, and I’ve heard nothing at all about the bed socks, so that’s anyone’s guess. The main thing, though, was that I managed to finish everything on time without going crazy (or becoming a shut-in) in the meantime. How did your holiday knitting go? 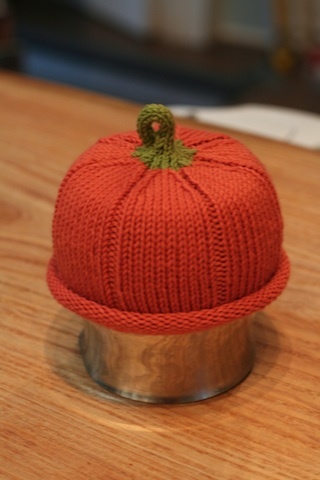 No, not a hat for a pumpkin. I’m clearing this up because yesterday, a woman came into the shop looking for needles with which to knit a pumpkin hat. When I said I had just knit one too, she laughed and said, “No, not a pumpkin-shaped hat, a hat for a pumpkin.” Since that’s maybe a thing, I thought I would clarify. Anyway, pumpkin hats. I have been planning to knit one for Baby Roud (who was born on Oct. 2 and is a little girl and just adorable) ever since, well, before she was born. I think babies should have funny hats, because it’s funny, and pumpkins in the fall are pretty cute without delving into the range of potentially tacky or overly embarrassing. I looked around for a while to find the right pattern, and eventually settled on this one: Kürbis Baby Hat by Natalja (kürbis being German for pumpkin, apparently). I changed the pattern a little, to make it smaller for a newborn (I cast on 10 fewer stitches and knit it on smaller needles) and after a few hours I had an adorable little pumpkin hat. It’s the curved stem that really gets me. It is quite little, although it stretches, so I donated the original to the shop and I’m making a second, which will go to the baby. This time, I’m going to work the recommended number of stitches (10 more than last time), but stick with the tighter gauge. Honestly, it’s so quick and so cute, I think every baby I know is going to get one from now on. Modifications: For the first hat, I cast on 65 stitches, increasing to 70. I also purled a row to stop the brim from curling, which turned out to be unnecessary. For hat two, I cast on 75 stitches, which I will increase to 80. I won’t bother with the purl row, and when it comes to the decreases, I’ll make them all k2tog, since the ssks look messy. Photos of Pumpkin Hat 2 to come.